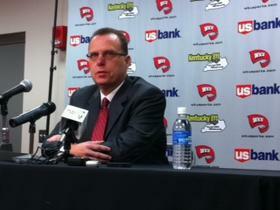 Western Kentucky University men's head basketball coach Ray Harper has resigned. The school announced Thursday night that Harper informed Athletics Director Todd Stewart that he was stepping down. The announcement came following news that three WKU basketball players had been suspended from the team following the outcome of a hearing by the University Disciplinary Committee. No further information was released regarding the suspensions of Frederick Edmond, Marlon Hunter, and Chris McNeal. Harper just completed his fifth full season as WKU head coach. He had an 89-64 record. Copyright 2016 WKYU-FM. To see more, visit WKYU-FM.